Please join me and New York Times best-selling author Peter Zheutlin (Rescue Road and Rescued) for an afternoon of photos and stories about animal shelter volunteers across the country. Both Peter and I have spent the past few years documenting the intricacies and beauty within the shelter system, and I'm honored to be doing this short book tour with him. These special events will feature a joint slide show presentation, Q+A with the authors, and book signing. Please join me and New York Times best-selling author Peter Zheutlin (Rescue Road and Rescued) for an evening of photos and stories about animal shelter volunteers across the country. Both Peter and I have spent the past few years documenting the intricacies and beauty within the shelter system, and I'm honored to be doing this short book tour with him. These special events will feature a joint slide show presentation, Q+A with the authors, and book signing. I'll be teaching a Dog Photography Class from 10-11am for all levels, focusing on how to create strong portraits of shelter animals. Then, we'll do a book signing and you'll get to meet a bunch of wonderful adoptable animals from the Centerville MSPCA. $10 tickets required, all proceeds go right to the MSCPA. Come by for a free dog photography class for people of all levels, focusing on how to create strong portraits of shelter animals. Then stick around for an artist talk, book signing and reception with the wonderful staff, volunteers and supporters of Berkshire Humane. RSVP's encouraged (email ebrown@berkshirehumane.org). Purchase a book at the event, or bring your own to get it signed! VIP Photo booth, book signing, vegan appetizers + cocktails, wonderful silent auction and adoptable dogs. Friendly on-leash dogs welcome. Artist talk, Q + A session, book signing and discussion with the director of Wags + Walks Rescue Lesley Brog. This event is limited to 25 people. 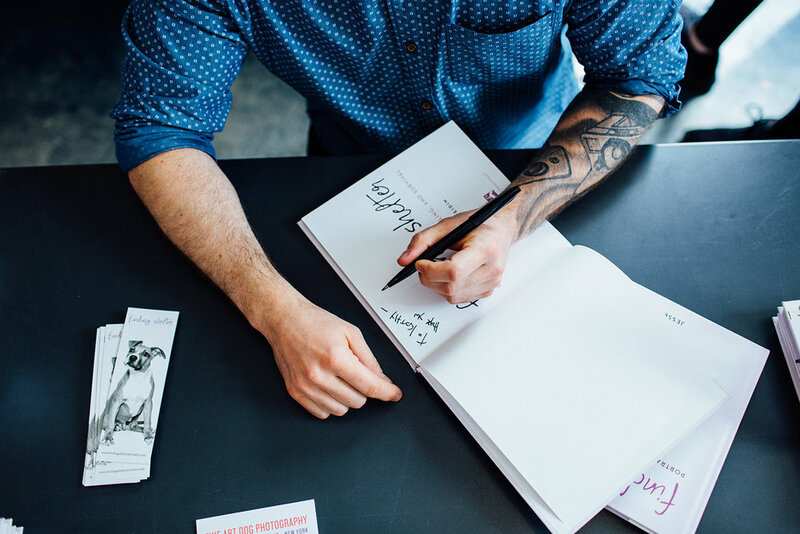 Artist talk, Q + A session, book signing, barn tour and opportunity to meet the BADRAP dogs. Book signing, Finding Shelter prints for sale, browse the lovely store and meet adoptable dogs from Muttville. Friendly on-leash dogs welcome. Sherri from Muttville will be joining us! Stay up to date on events - Join our mailing list!